so finally… some paris photos! i love taking photos, i just hate dealing with them once they’re uploaded. this part always takes me a while. in june i spent three glorious days in paris before heading south to cannes for one week. it was my first trip to france since 1999, and so much was different. last time, i was about a year out of school. i stayed with my sister, who was there as a student and had way too many roommates in a strange apartment filled with inflatable furniture. it was still great, but… this time i was with mk, we stayed in the marais (here; see photos from the neighborhood above) and my goal was simply to eat eat eat, shop a bit, and relax. well, we were super successful at eating. (and the other stuff!) but mostly at the eating. i’m talking gold medal. (translation: i made myself borderline ill.) it was totally worth it. as for where we ate? i’m really proud of what we fit into three days… it started with a stunning lunch at Le 6 Paul Bert, (chosen after reading this) after which i decided i really needed to get four eclair from L’Eclair de Genie. not one, to just savor and enjoy. four. a sampling, if you will. i took a bite of each back at the hotel room, decided i might die, and took a nap. later we found ourselves at the wine bar of Frenchie, drinking a great white wine and holding out for a table, which we finally got! (at the wine bar, not at the restaurant itself – another time.) tip: get there around 7pm, and you might only wait around 90 minutes for a table. but it’s a thoroughly enjoyable wait! our table ended up having a view into the kitchen, and the food was excellent. i don’t want to make this post too long so i’ll save shopping bits for another time. i also, for the first time ever, created a google map specifically for the trip. i’m obsessed with making maps now, and might post it here if anyone is interested…? there’s a lot of stuff on there i didn’t have time for, so it’s kind of a wishlist in a way, but i love looking at it. row 2: snippits from Le Meurice… how amazing is that “apple” dessert? 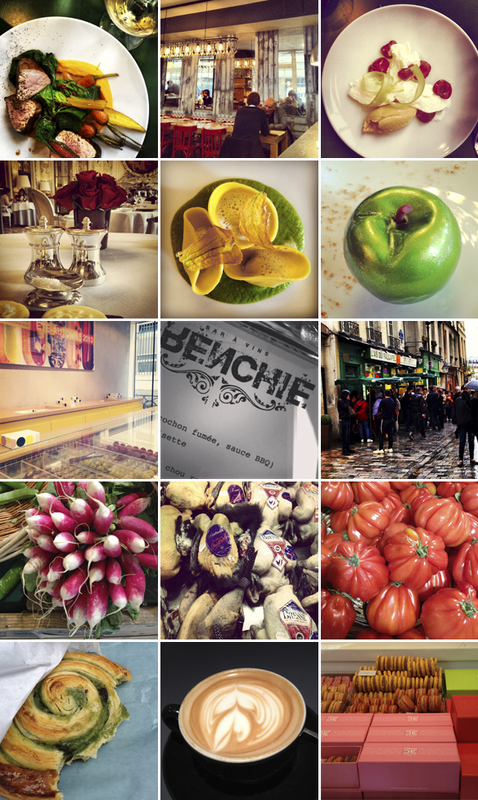 row 3: inside L’Eclair de Genie, the Frenchie bar menu, and a huge line of people outside a falafel shop in the marais. i was tempted. row 5: pistachio chocolate croissant, the best cappuccino, and great packaging at one of the many sweet shops i poked into. hi there. i'm a brooklyn based food stylist obsessed with travel, design, babies on motorbikes, street food, and new york city - my first love! i'm happy you're here.